Having a solid marketing expert, or marketing team, is essential for small businesses who want to grow. In this guide, we show you a marketing recruitment process that helps you find the best possible candidates in the most efficient amount of time. Indeed.com is the largest job board in the US, and especially useful for salaried positions like marketing jobs. Indeed also provides tools like questionnaires, email templates, and interview scheduling, which makes it a one-stop solution for businesses that want to follow a structured hiring process. This is why we’ll be using Indeed.com as an example throughout this guide. To follow along with your own free employer account, click the button below. The importance of a strong, accurate job title cannot be understated, as this is the one of the primary ways applicants will find your ad (via web search). Even subtle changes in wording can affect how easily applicants find your ad. For example, “marketing manager” is used almost 7x more frequently than “marketing director,” and “marketing assistant” is more common than “marketing associate” or “coordinator.” You can see for yourself using Indeed’s Job Trends tool. This should be a clear and concise outline what your company does and why someone would want to work for you. This section should be 3-5 sentences max. What will be the day-to-day responsibilities of the new employee? This is actually one of the first exercises you should complete. Listing all the specific tasks they’ll complete, and the estimated hours associated with each, will help you confirm the hours (full time vs part time) and skills required for the role. If you’re not a marketing expert yourself, be sure to consult your marketing team for advice. For the actual job description, you don’t need to get quite as detailed. I wouldn’t worry about listing hours, for example, but I would make sure all the key daily tasks are listed. First and foremost, how much experience do you need? Do you prefer a junior marketing team member who will need some training, or a senior member who can be a potential team leader? 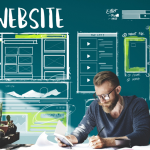 Here, you’ll also need to outline the skills required, which may include creative writing, graphic design, SEO, PPC, or email marketing. If you’re having trouble thinking of the exact skills your new marketing rep might need, consider looking at what marketing job seekers list on their resume. You can search resumes for free on Indeed, and might see skills like ‘video production’, ‘Facebook advertising’, or other unique talents that you hadn’t thought to include, but might be great in your marketing job description. Postings with salary range included tend to get a lot more traffic than those without. Make sure you include a range with a 25-30% difference, depending on experience (e.g. $60,000-80,000). Marketing managers in the US currently have an average salary of $72,929. Marketing assistants earn $36,870 per year, on average. You can see how other titles compare using Indeed’s salary comparison tool. It can also help to figure out the compa ratio for the position. For more advice on what to include in any of these sections, check out our full guide on how to write a job description. First off, if you don’t have one already, you’ll want to make an Indeed employer account. This is super easy and will enable you to begin posting job ads, among other benefits. If you want to know more about how to complete your Indeed employer profile, check out our article on Indeed company pages. Once you have an employer account, you can begin posting a job ad. On the top-right of your employer dashboard, you’ll see the button “Post a Job.” Click that and begin the walk-through. 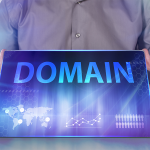 What follows is several, easy, fill-in-the-blank steps like putting in a job title, location, job description, qualifications, and any questions you want the candidate to answer. Then you can preview how everything you entered looks like before your posting goes live. If you only want candidates with specific types of marketing experience— such as SEO, email marketing, social media, or PPC— use the question space provided by Indeed. This will prompt applicants to answer whether or not they have experience, and for how many years. Those who do not meet the minimum requirements can be automatically disqualified. You can learn more in our article on how to get the most out of your Indeed job posting. Although your job ad is now public, you may want to go out and find candidates, rather than wait for them to stumble on your ad. This is what recruiters call “sourcing”, which means finding passive candidates. Step 2: Click on that and you will be redirected to Indeed’s resume database. Here, you can view a list of suggested candidates. If there’s anybody you would like to contact and invite to apply for your job, you can do this at a cost of $1 per candidate. Step 3: To expand your search, you can enter a keyword in the search bar, and/or use filters on the left toolbar. Click on “Advanced Search” right below “Find Resumes” if you want to search for specific job titles, companies, school names, or other details that might appear on candidate’s resumes. Now that you have a solid candidate pipeline, whether it’s via applicants, sourced candidates, or both, you will want to set up short phone interviews. Regarding your No pile, Indeed lets you save a rejection email template. 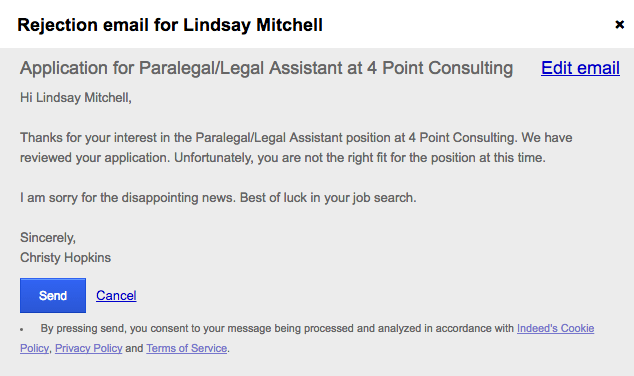 This is a pre-written response that notifies applicants they will not be considered for the job. You can write your own, or use a classy template provided by Indeed. Regarding your Maybe pile, my personal recommendation is to send an email like, “Thanks for applying, we will be in touch in a week or two”… then once you have some phone screens with your “Yes” pile, the “Maybes” will become easier to place in the “Yes” or “No” pipelines. For your “Yes” pile, you’ll want to schedule phone interviews as soon as possible. 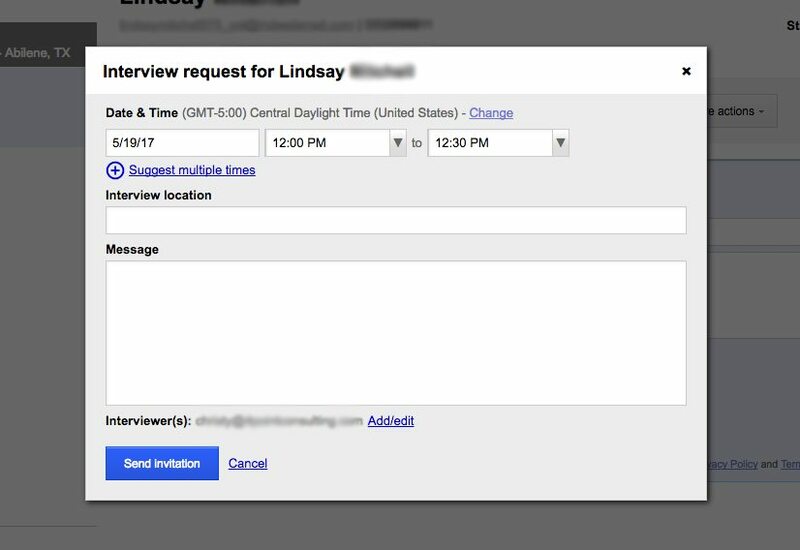 First, respond to candidates inviting them to an interview (Indeed also lets you save a template for this or you can send a calendar invite). Then, you’ll want to work on a template for your actual interview. We have a great 30-minute phone screen template, but you’ll want to make sure this is customized to cover your must-have points. 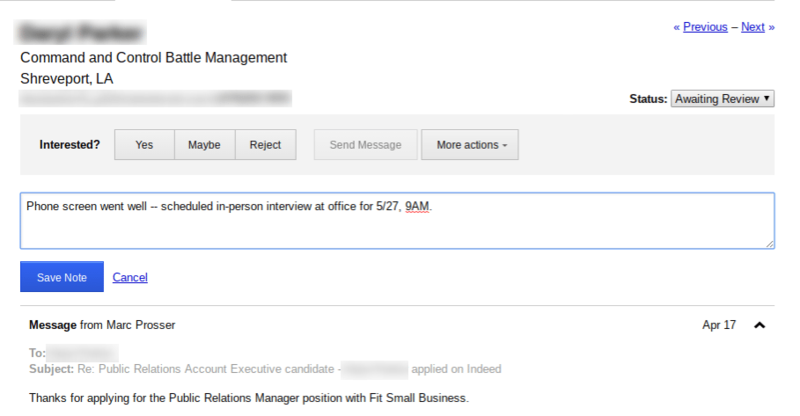 For example, if the candidate must know Google Adwords… ask this in the phone interview! Don’t wait for the in-person interview to touch on the must-haves since that is what the phone interview is for: It’s for qualifying the candidates against the job description. Don’t forget to take good notes in Indeed on how the phone screen went and if you want to move forward to the next step: Conduct an in-person interview. Taking notes is especially useful for legal reasons regarding hiring decisions (for example, if you need to defend a hiring decision), as well as the simple reason of keeping you and your team organized on who is who and who said what. You can then worry about cultural fit more in the next step. Pick your interviewers– Who will talk to the candidates? Determine the time & length of the interviews– How long with each person have or should some people double up? Get your logistics worked out– What room will be reserved and is it on a day/time that works for everyone? Prepare & get a set question list for everyone– You’ll want to prepare something for every person who is involved, or at least review what they have prepared. Every interview goes better with some structure to it, or even a complete formal structured interview, which lowers your legal risks and also provides a good comparison point. Discuss the candidate(s) and how they did in the interview. Like applicants, most candidates become a strong Yes or a strong No… but there are a few who hover in the Maybe land. This is why having 3-5 people come in will help give you a good perspective on what is out there. Inform the candidates who you know are no longer being considered. For the Maybe and Yes candidates, decide on next steps, which we talk about in step 5. Assuming you’re looking for a candidate with past experience, your interview questions should focus on their past efforts (including both failures and successes) and their general beliefs/philosophies within the marketing field. Can you show me proof of ROI (return on investment) on marketing campaign(s) that you’ve led, designed, or otherwise participated in, as well as what lessons, both good and bad, you learned from them? What blogs and resources do you follow online to keep up with the industry? Please share with me your portfolio or any marketing materials you have created in the past. Share with me the process on the creation of these materials. How did you build up your own personal social media channels and online presence? What do you think works or does not work? How do you deal with a project that’s gone over budget or pushed past the deadline? Read more about these questions in our guide to the best interview questions for employers. A unique aspect of marketing recruiting is that you need to be able to figure out who can really walk the walk and not just talk the talk. Many candidates are well-versed in theory but struggle with real, hands-on running of marketing campaigns and projects. This is why we recommend adding in a paid test project or campaign to your marketing recruitment process. Use one of Indeed’s pre-programmed assessments. Depending on what your marketing team does, you also could invite the person in for a half day or full day to work with the current marketing team on their projects. This should be a paid day, especially if they will be working and not observing. A note on payment: if you plan to use what the candidate provides for your business, or if you could, you will want to pay them for it in order to be on the up and up. If you don’t hire them and you use their campaign… and they find out… this could get you in hot water legally. You should now be down to 2-3 finalists after working on the test project or realistic job preview, or you might even have “the one” and you can skip down to step 7. Indeed allows you to save notes directly on a candidate’s application. Below, a log of email interactions with the candidate. Now, you need to decide on who is the best hire for your business. We highly recommend involving other people in this decision, even if they haven’t been already. Consider who the new hire might be working with or under, and not just your viewpoint as a business owner, or check out their recommendations on LinkedIn. Then, you can have a constructive and professional dialogue on who should get the job offer and why. Much of the time, people focus on the applicants needing to impress the business owners and/or hiring managers in the marketing recruitment process. Once you have that top dog though, you need to impress them in order to get the offer letter signed and the tables have slightly turned. You can call and give them a verbal offer (which can be held up in court, so it’s best to not be specific if you don’t have specifics yet). You can call or email and ask them to meet in person as soon as possible to present the offer. You can email them the offer letter in full. Once you have given them the offer, give the candidate space and time to review the offer and ask questions over the next 24-72 hours. Then, once a candidate has accepted the offer, you can start the employee onboarding process and consider them a new part of your marketing team! Don’t forget to record in Indeed who you extended offers to and who accepted; this is good for future reference on your hiring metrics and can help you improve your marketing recruitment process. Marketing recruitment often involves finding candidates with very specific experience and skill sets. To do this, you’ll need to cast a wide net, and set up a strong recruitment process that allows you to filter applications and screen candidates efficiently. Indeed offers many of these recruitment and application management tools for free, or for a small additional cost, so it’s a great place to begin your marketing recruitment.